There is a new Archbishop for our Diocoese. He is an avid canoeist, so I had a paddle that was to be presented to him. 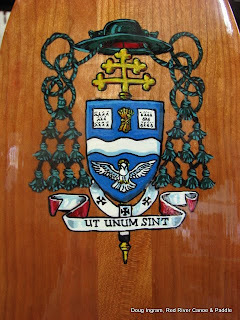 This is his coat of arms that I painted on to personalize the paddle. 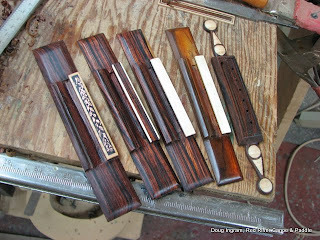 And while I was making guitar bridges, I finished the bridges for the other guitars. The humidity is holding out at 50%, so its a good time to get this done. Posted by Doug Ingram at 9:55 a.m.
Hi Douglas - thanks again for your reply to my questions re a 12-string classical guitar today. You do beautiful work - I love the photos of the bridges and of the double cutaway. I've built only 1 guitar so far - it was a success, but it's not one I would go out of my way to show anybody at this stage. This winter I will be building two classicals, including the 12-string. My focus on the other will be to get superb sound, or as close as I can get to that. I had seen your name before on the WCGS web page. I'm not a member now, but I was one of the group that revived the Society around 1983 after it had been defunct for 5 years. I was then the pres for a couple of years and remained a member for a few years after that. I'm not a canoeist ... but I have the distinction of having worked at the Kildonan Canoe Company for one day when it was just off Main Street in 1964 ... on the day it burned down. It was an electrical fire. My first thought was that we should get the canoes out of the building, but the guys who worked there knew better. It was one heck of a fire. That was my last day on the job, because they didn't reopen (off Pembina Hwy, as I recall) until some weeks later. In the meantime, I had to find another summer job. Keep up the blog! Good stuff. November 6, 2009 at 11:15 a.m.